Da Nang (VNA) – Vietnamese maritime search and rescue force on March 22 picked up a sick crewman onboard a Greek vessel in Vietnamese waters and took him to the central city of Da Nang for treatment. 42-year-old Michael Samorin, a Philippine national, suffered from a bellyache with no clear causes on March 21 evening when his ship - the Greek-flagged Maran Taurus was in the waters to the south of Tri Ton island of Hoang Sa (Paracel) archipelago, en route from Singapore. The vessel’s captain requested medical assistance from competent Vietnamese agencies. 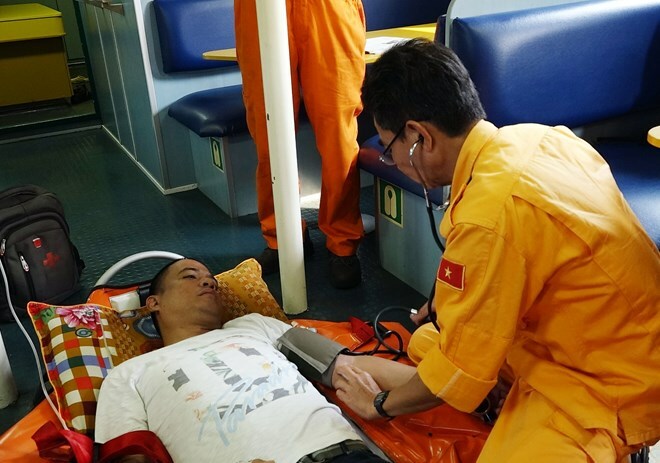 After receiving the request, the Maritime Search and Rescue Coordination Centre guided the ship to sail towards Da Nang and dispatched vessel SAR 412 along with a group of medical workers to pick up the patient. Local doctors said that Michael Samorin showed symptoms of appendicitis and needed urgent treatment. The crewman was brought to Da Nang at 8:37 am on March 22, and was quickly hospitalised for treatment.